We are officially into the second week of Veganuary, the 31 days of veganism challenge which, as I mentioned in my New Year post, I have taken on this year. Going vegan doesn't mean I'm missing out on any sweet treats, however! I've shared a vegan chocolate cake recipe on my blog before, and I am always scouring other blogs and YouTube channels for more vegan cooking inspiration! 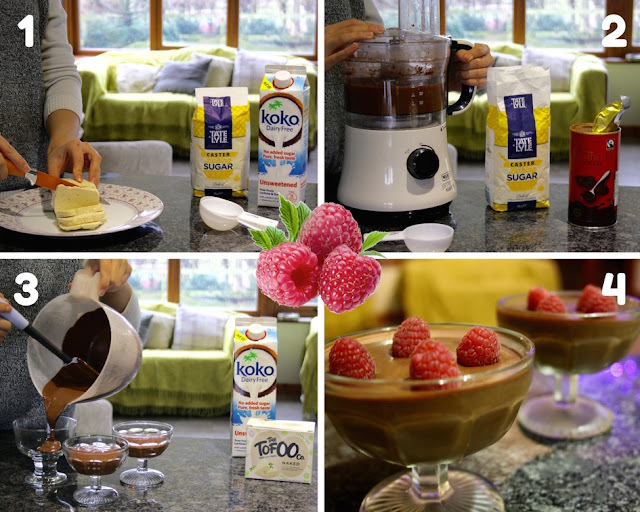 So, when one of my favourite YouTubers, Marzia, posted a no-bake vegan pudding recipe (see the video below), I just knew that I had to recreate it! The recipe is very simple, with only four ingredients, four steps, and there's absolutely no baking required. 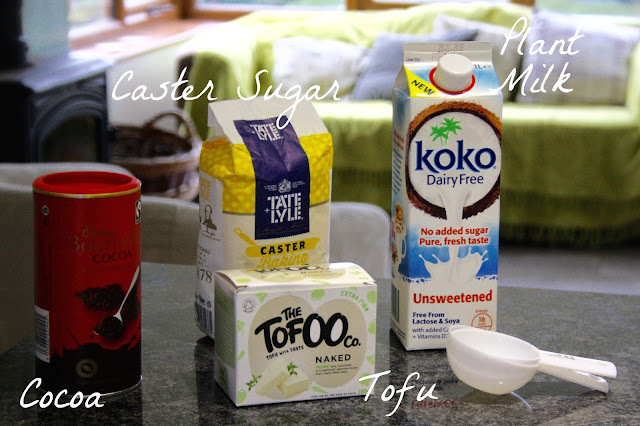 It also contains a rather unexpected ingredient - TOFU! I had never heard of tofu being used in a sweet recipe before I watched Marzia's video but after tasting the mousse for myself, I'm a total convert! The mousse I created had a slightly coarse texture, which may have been to do with the rather rickety old food processor that I had at my disposal, but it was still really tasty and I wouldn't hesitate to make it again as a sweet chocolatey treat! Step One: Drain and (if appropriate) press your tofu. I chose a tofu from The Tofoo Co. which did not require pressing, but if yours does need to be pressed, simply remove it from its packaging, place it on a plate and then put another plate on top. Weigh the top plate down with something moderately heavy, such as an empty saucepan and leave it to gently press down on your tofu block. Come back every half hour or so to drain the liquid that will accumulate on the plate. When your tofu is nice and firm after 2-3 hours, you can start the mousse-making process! Slice it thinly and get ready to blend. Step Two: Put your sliced tofu, along with the cocoa powder, sugar, and plant milk into a food processor and blend it all together until you achieve a smooth consistency. Step Three: Pour your mixture into glass jars / ramekins and leave in the fridge to set. In her video, Marzia left hers to set for 15 minutes and found the mousse to be a bit runny, so I left mine in there for about 4 hours and it had firmed up a little better. Step Four: Once your mousses have set, you can top them with anything you fancy! I went for a few tangy fresh raspberries and a generous dolop of delicious Oatly vegan creme fraiche. 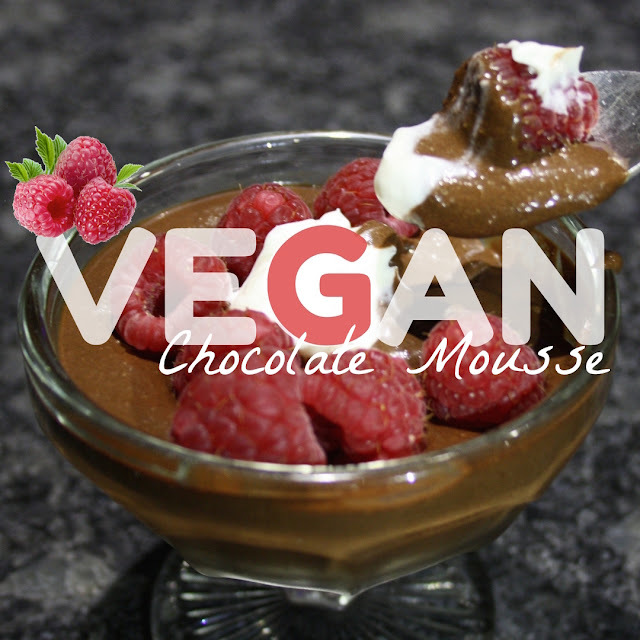 And there we have it - a delicious vegan chocolate mousse to tempt even the most discerning tastebuds! Thank you to Marzia for the inspiration, I hope I've done your recipe justice! What is your favourite sweet treat? Let me know in the comments. Are you following my January advertisers? Their content is second to none!